The Jourards came from Russia and emigrated to Canada, with infiltrations into the United States. This is their story, as told by Sadie, one of the six children of Annie and Albert (Louis): Harry, Leon, Sidney, Claire, Sam and Sadie. Albert Louis Jourard and Annie Rubinoff, who were both born in Czarist Russia, met and married in Toronto, Ontario, Canada in 1910. They had 6 children, 16 grandchil dren, and (so far) 9 great-grandchildren. Louis died in 1955 and Annie in 1975. This history is for the grand and great-grandchildren who have limited memories or no personal knowledge of these remarkable individuals. 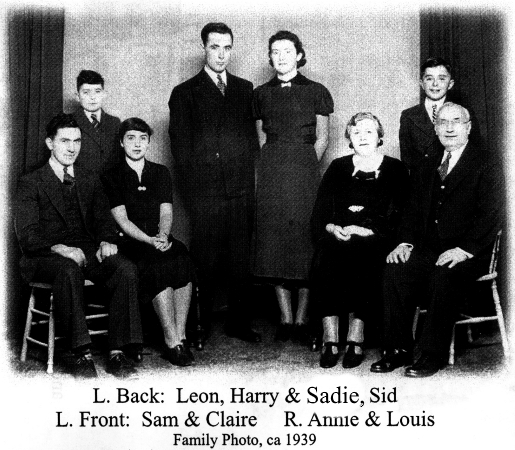 Louis, the youngest of 5 children of Simeon Zurar and his second wife, Sarah Kehz (Kates? ), was born in December 1880 in Myshagola in Lithuania near Vilna. He learned woodworking and worked in the Ukraine in Zhitomir until, at 21, he was called up for mil itary service. 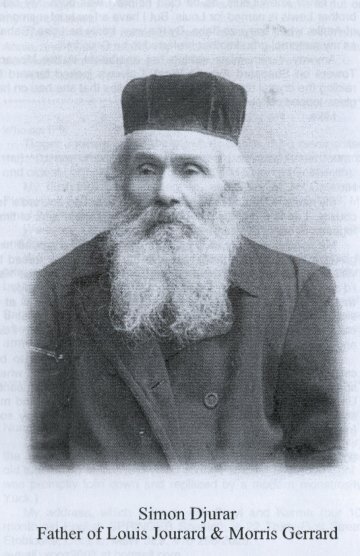 He served 3 years in the Czarist army in Saratov on the Volga until 1904 or 1905, when the Russo-Japanese War broke out. His regiment was ordered to go east, but Louis, who had no personal quarrel with the Japanese, decided to go west and desert ed the army. He was helped by local Jews who provided civilian clothes and false papers, and he made his way back to Vilna. His older brother, Henri, who had been in Paris, France, since the turn of the century, wired him money so Louis was able to join him there, after various adventures riding in boxcars and having his food and belongings stolen. He loved Paris and the French, but stayed only 6 months and came on to Canada, where his next older brother, Maurice, had been for some time. There were also some nephews near his own age, surnamed Shapiro, the children of Samuel Zurar--a much older half-brother from their father Simeon Zurar's first marriage to a wife who died young, leaving as well a small daughter Minna (mother of Eli Saul). The name Shapiro was taken by Louis' nephews, possibly as a way of avoiding the draft. The name "Zurar" evolved from a placename, "the man from Zur". Henri in Paris gave it a French spelling "Jourar". On arrival in Toronto in 1906, Louis added a "d" to make it "Jourard". Maurice spelled it "Gerrard" because that was the spelling imposed on him by some Anglo immigration official on arrival in Canada. Louis worked for a time as a wood turner in Berlin, Ontario (later renamed Kit chener) until he suffered a head injury at work and a doctor advised him to work outdoors. He became a peddler of watches, jewellery, etc., in the lumber camps of Manitou lin Island and Upper Michigan state, travelling with a horse and wagon. In harvest season, he enjoyed helping the farmers bring in the crops. He and Maurice, who also was a peddler, came to Toronto for the "Ex" and to meet girls. They met their respective wives-to-be, Annie Rubinoff and Luba Glass, at a union picnic in High Park. Annie Rubinoff was born in December 1890, the third eldest of 6 children born to Rachmael Rubinoff in 3 marriages (his wives died young). Annie was the first girl in the second marriage to Sarah Usprech who died when Annie was eight. Rachmael's third marriage produced the youngest sister, Sonia, whose mother died soon after. Until the age of twelve, Annie lived with her family in her "shtetl" and birthplace, Hwanyicki, in Minsk Gubernia (province) near the Latvian border. At the age of 12 or 13, she was sent to Ekaterinasberg to live with a Jewish tailor and his family, as an apprentice, to learn tailoring. These people were kind to her but she was desperately homesick, especially at holiday times such as Passover. Pogroms against the Jews occurred in the town, espec- ially at Easter time, and the family had to hide. 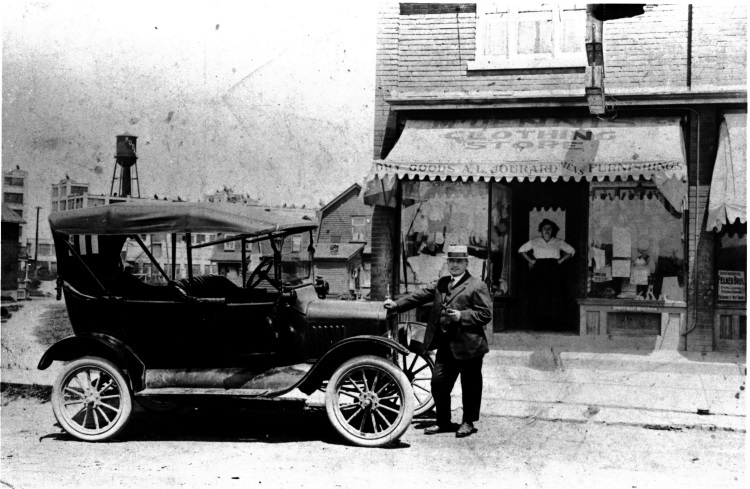 Annie's father and older brother Israel emigrated to Toronto because of the po groms and set up a wholesale grocery business on Dundas Street West near University Avenue. They sent for Annie in 1905 when she was 14 and she travelled alone, but with a group from their home town (Landsleit) on false papers, as the younger sister of brothers named Gould. The women in the group looked after her on the long trip by boat to Liver- pool and in the passage to Canada. She turned fifteen on the boat on December 24, 1905, and landed in Halifax on January 1, 1906. Over the next four years she worked in the garment trade on Spadina Avenue, sewing buttons on coats. Her earnings helped bring over from Russia her remaining sib lings, Michla, Fanny, Bertha, and Sonia. The latter two were the only members of the family to attend school in Canada. They completed public school and business courses to become secretaries. Michla and Fanny married soon, and the two youngest lived with their father and his successive housekeeper-wives (two in number). After her marriage, Annie kept in close touch with the two youngest and they spent many weekends with the family. The writer (Sadie) remembers as a toddler awaiting their arrival, by trolley, with joyous anticipation. They often arrived with lengths of fabric which Annie turned into dresses for them. After their marriage on October 16, 1910, Annie (20) and Louis (30) lived briefly on Manitoulin Island (Gore Bay) and in Wingham, Ontario. Their first child Harry was born August 4, 1911, in Toronto, at the home of Michla on Maria Street. They returned briefly to Manitoulin Island. Then, in 1912, they moved to Mount Dennis, a northwest suburb of Toronto, part of York Township. Here they opened their first dry goods busi ness at 1129 Weston Road. They prospered through World War l and the 1920s, expanding it to 1131-1133 and, latterly, to 1135-1137 Weston Road. The family lived behind and over the two stores. One side was dry goods and ladies wear; the other side was men's wear. Four of the next five children were born at home, delivered by Dr. Pearson or Dr. Sproule, aided by Mrs. Franks, the midwife who lived immediately behind us on Brownville Avenue. She took a great interest in Annie and became her mentor in such skills as canning and jam-making. After five home deliveries, Annie was treated to the luxury of a hospital confinement for Leon, at Toronto Western Hospital, February 28, 1929. All six children graduated from Dennis Avenue Public School and York Memorial Collegiate Institute. 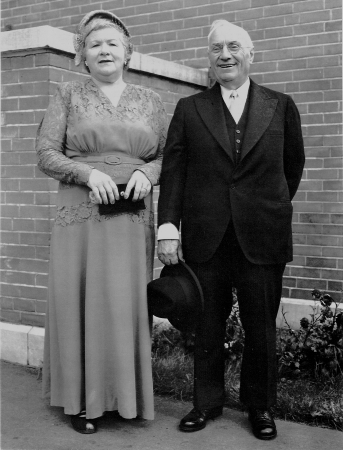 In the 1930s, during the Great Depression, and throughout World War II in which the two eldest sons served, Annie and Louis worked together as equal partners in their stores and helped all of their children complete higher education and achieve careers, despite some very lean years and shaky finances. They retired from business in 1947 and for almost the first time in her married life, Annie was able to live "private" in a proper house with a crystal chandelier--her dream house! Within a few years, all of the children were on their own or married. The house on Newgate Avenue was too large, so they sold it and bought a bungalow on Wigan Crescent. As well, they helped most of their children with gifts of money towards down payments on homes of their own. After Louis' death in November 1955, Annie lived independently in an apartment for twenty years until a few months before her own death in April 1975 at the age of 84. The legacy bequeathed to their descendants by Annie and Louis consists mainly of intangibles: "good genes", i.e. strong bodies, excellent health and intelligence, good char acter, humour, and courage. An example of Annie's gutsiness is her undergoing a second cataract operation on her second eye when the first operation in 1970 failed and she was left blind in that eye. Although both Annie and Louis had grown up in devoutly religious orthodox fami- lies within the Russian Pale of Settlement, both broke free of orthodoxy and never belonged to a synagogue, nor were they fully observant of dietary laws. In fact, Annie's father would not eat a meal in her house. Both Annie and Louis proclaimed themselves "freidenkers" ( free thinkers) and, in later years, supported liberal and left wing causes. They retained, however, great pride in their Jewish heritage and the fact that Louis was a member of the Kohanim (the priestly tribe) was an integral part of his self-respect and self-esteem. Louis had a good Hebrew education (which impressed his future father-in-law enough to accept the marriage) but neither Louis nor Annie had any formal schooling in English. However, both valued education, loved music, theatre, movies, and TV. Both were wonderful "balabatim" (householders and housekeepers). They knew how to repair anything, make over and make do. During the lean years, it was said of Annie that her aprons had patches on the patches. By example, they inspired their children to move out into a larger world, to involve themselves in the community and to enjoy life. Louis joined the Masonic order and encouraged Annie to join the Eastern Star. Louis was also in the Mount Dennis Busi nessmen's Association in the 1920s and was its president at one point. He was also on advisory committees for the York Township Board of Education when a technical high school was to be built. Their generosity and compassion were well known in the area. Annie was particu larly soft-hearted and fed many a dusty, unemployed wanderer who rolled off a freight train from the railway tracks a block away during the 30s. The Jourard household was always huge, with 6 children, a live-in maid, and a store clerk ("Big" Sadie Usprech, Michla's daughter), plus sundry immigrant relatives: Sam Gitler, Alta Leah Jourard and, for a time, an entire family --the Hellers (Alta's older sister Chayele, husband Jules and 3 daughters), all of whom Louis helped to bring over from Poland and to become established. For a time, Louis set up a furniture manufactur- ing company with Jules Heller on St. Patrick Street, but pulled out due to personality conflicts and Heller carried on alone. Physically, Louis and Annie were short, about five-foot-five or five-foot-six inches tall (actually, Annie was about an inch taller than Louis), heavy-set and strong. Annie had a longer neck and longer limbs. It amused Louis that he had a smaller foot than she. In their younger days, both were dark-haired and hazel-eyed, and turned pre- maturely grey. In fact, in their bachelor days, Louis and older brother Maurice tried dye- ing their hair, often with disastrous results. In early photos, Louis, when still in his 30s and 40s, looked much older. The heavy diet and heavy pipe smoking brought on a circulatory condition in his leg called Burger's Disease in 1927-28. When he was advised to have the affected limb amputated, he sought a second opinion and found his way to the Mayo Clinic in Rochester, Minnesota, in the summer of 1928. The months spent there cured him and changed the family diet. Louis was a model patient who followed instructions to the letter regarding proper nutrition and exercise. He also quit smoking. He was never again ill until his death (at home) of stroke in 1955. Annie was rarely ill and had enormous energy. "She could work rings around five younger women," was often said of her. The only hospital stays after 1929 were for her two cataract operations in 1970 and during her terminal illness over a six-month period from October 1974 until her death of heart disease and esophageal cancer in April 1975. When the second youngest son, Sidney, died in a freak accident on December 2,1974 at age 48 in Florida, her family in Toronto faced a terrible dilemma: whether to tell her, or to con ceal the dreadful loss. She was in hospital and was not expected to survive the heart I attack. Rightly or wrongly, Sid's death was concealed from her. She survived a second heart attack and awoke from a coma on New Year's Day, 1975, demanding to know what was going on and who was responsible for her being there! She may have suspected something was wrong about Sidney's prolonged silence (he wrote her constantly) and not believed the story that he was "lecturing abroad", but she died after a third heart attack on April 16, 1975, without being told the truth and with her two daughters holding her hands. Hers was a splendid life -the life of a "mensch," as was Louis', with love of family and each other the highest value.